A new list of products claims to show dozens of cases for Apple's "iPad mini" from major third-party accessory makers Belkin, Kensington and Trust. The list was published on Wednesday by ilikeApple.pt. 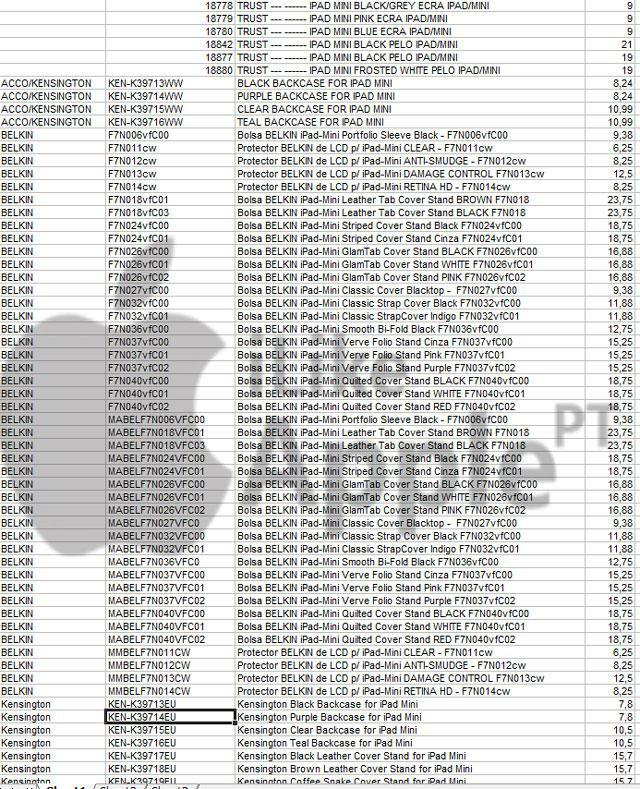 The spreadsheet of product names and identifiers does not have a source, though similar leaks in the past have come from retailers such as Best buy. AppleInsider cannot comment on the validity of the list, but case makers often make new products based on leaked and rumored schematics ahead of Apple product unveilings. For example, a number of cases based on the design of the iPhone 5 were on store shelves almost immediately after Apple's handset was announced, many of them advertising that they were simply designed for the "new iPhone," as they were completed before the official name was announced. Among the products listed are the usual cases and screen protectors that accessory makers offer. Various cases for Apple's rumored 7.85-inch iPad have also been captured in images from China. Interestingly, one of the purported Belkin products carries the name "RETINA HD." However, the title is likely to apply to the name of the product rather than the display on the "iPad mini" itself. Apple's smaller iPad is not expected to have a screen with as high of a pixel density as the new iPad with Retina display.